Looking for something pretty and unusual to decorate your patio, home or bar? 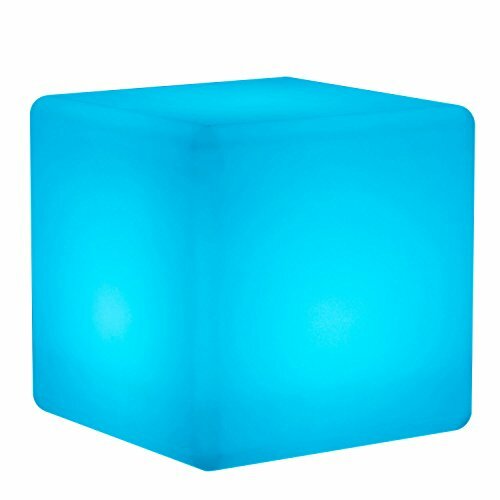 This fantastic LED cube is a brilliant piece of ambient & decorative lighting in one fun package. The polythene LED illuminated cube is waterproof, shockproof and battery operated, so it's easy to use anywhere. Put this fun LED light up lamp in your pool or sit it on your patio for a great evening lighting decoration. With a full charge, the long lasting rechargeable battery will provide up to 12 hours of continous light, and the smart LED light saves you money and energy. It never gets too hot, so it's perfect for using in the kids' room, too. This LED light up glow cube decoration is so versatile. Put one in your garden, use one in your bedroom, use them for parties and so much more. Wireless and controlled by remote control, the cube can be set to change colors or you can choose the perfect color to suit your mood. Like all our products, it's made by manufacturers who specialize in high quality LED lighting products that are built to last. - US Style AC Adapter, 110/220V 50/60Hz Input, 4.2V 800mAh Output. - 3.7V rechargeable lithium ion battery, 4-6 hours charge time, up to 12 hours operating time. - Charge port with waterproof cover on base of cube. - There is also an on/off switch on the bottom of the LED Cube. This cube features IP68 waterproof rating, it's water submersible and water resistant and can be floated in a pool. Ultra Fun - 16 gentle color tones, 4 color chaning effects, color brighten/dim and effect speed adjustable by operating on a credit card-sized remote control. Good Battery Life - Powered by built-in rechargeable Lithium ion battery, can provide up to 12 hours continous light on a full charge, and it never gets hot. Strong and Durable - Made from premium quality extra heavy duty BPA-free recyclable polyethylene plastic, never will you fear again a plastic product that snaps under pressure. Elegant and Stylish Design - This Magic Color-changing LED Cube Light is always the center of attention at any affair. If you have any questions about this product by Mr.Go, contact us by completing and submitting the form below. If you are looking for a specif part number, please include it with your message.